Everything you need to know about monetary policies, their impact on your quality of life and financial future, and how to protect yourself against them. Written by the New York Times bestselling author team who brought you Endgame: The End of the Debt Supercycle and How It Changes Everything, this book spills the beans on the central banks in the US, UK, EU and Japan and how they've rigged the game against the average saver and investor. 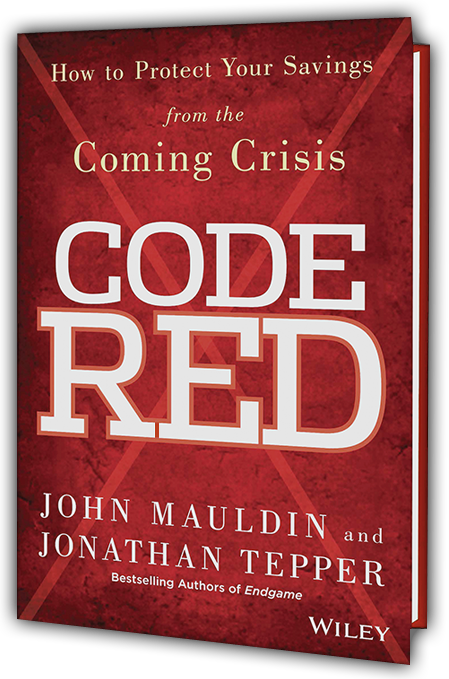 More importantly, Code Red shows you how to protect your hard-earned cash from the bankers' disastrous monetary policies and how to come out a winner in the irresponsible game of chicken they're playing with the global financial system. From quantitative easing to zero interest rate policies, ZIRP to the impending currency wars, runaway inflation to GDP targeting, authors John Mauldin and Jonathan Tepper achieve the impossible by not only explaining global monetary policy and its consequences in plain English, but making it compelling reading. Today is a time of financial repression, in which central banks keep interest rates below inflation and average savers and investors are forced to face high risks and low rewards; where there are clear winners and losers as prudent savers are called upon to bail out reckless borrowers; where the rich keep getting richer while pensioners, many in their seventh and eighth decades, are competing with teens for increasingly scarce minimum wage jobs just to help make ends meet. How did we get here and where are we headed? What can you do to insulate yourself against and profit from the economic upheaval and secure your financial future? Find out in Code Red. As the coming crisis unfolds, the situation will change quickly. Stay up to date with the latest economic insights from your authors. John Mauldin’s wildly popular weekly column, Thoughts from the Frontline, covers of the shifting global investment landscape like none other. Or, learn more at MauldinEconomics.com. Jonathan Tepper and team provide macro research written with the money manager and decision maker in mind.Their clients are some of the world’s most successful, forward-looking asset managers, prop desks, hedge funds, family offices, and more. © 2013 Mauldin Economics, LLC. All rights reserved.